Bunny, 1991, wig hair, pencil, crayon, collage, watercolor on phone book page, dimensions variable. Two separate shows reflect on AIDS, community and compassion. Downtown Manhattan in the latter part of the 20th century is something of lore if you grew up interested in the arts, alternative rock, counter-culture or battling corrupt government. Nan Goldin was no stranger to 1980s New York City’s dangerous and drug fueled streets. She moved to New York following her graduation from the School of the Museum of Fine Arts in 1978 and quickly began photographing the burgeoning arts scene. Goldin befriended and photographed the many vibrant characters that populated the Bowery neighborhood. Among those documented in her work was Kathleen White. In dual shows up at Pioneer Works, curator David Everitt Howe — along with White’s partner Rafael Sánchez — returns Spirits of Manhattan to the gallery setting in tandem with Nan Goldin: Kathleen, which features five portraits of White taken by Goldin in the 90s. 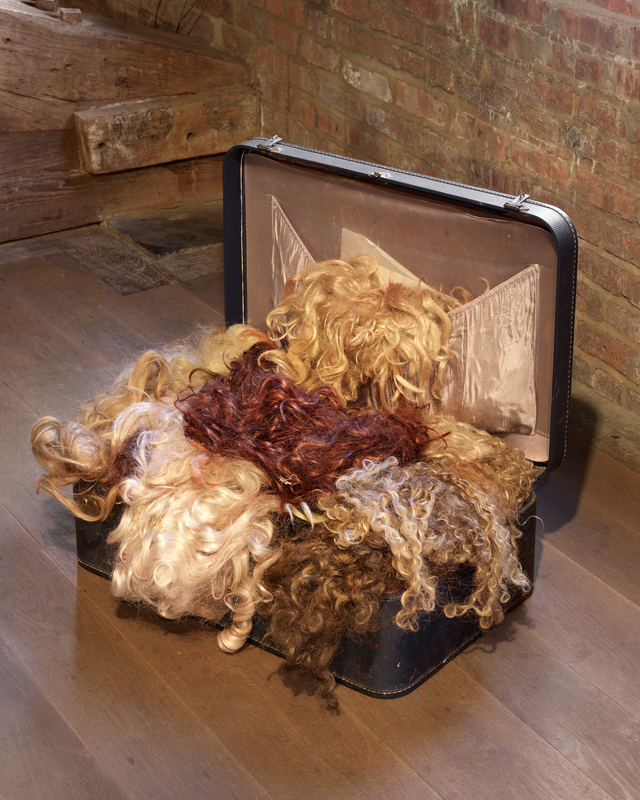 Wig suitcase, c. 1990s, suitcase, wigs, dimensions variable. 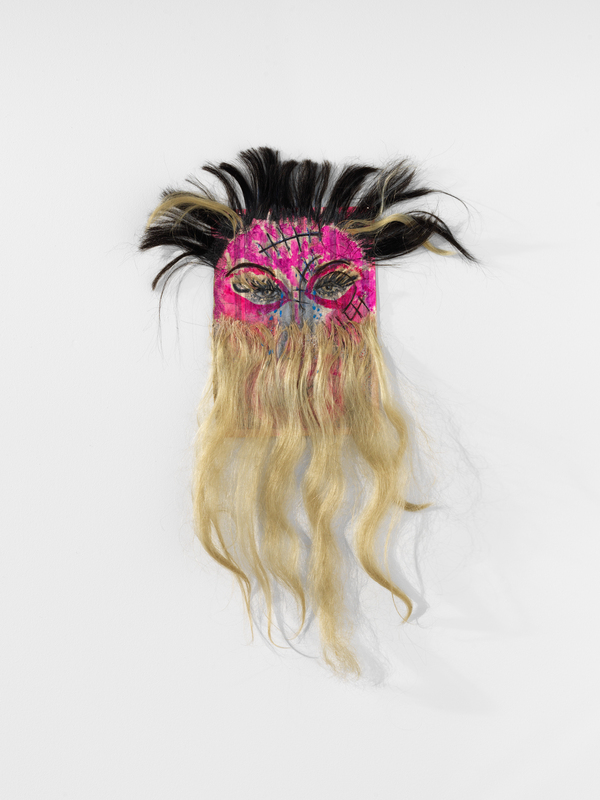 Flloyd, 1991, wig hair, hair, watercolor, acrylic, glitter, pencil, and eye pencil on phone book page, dimensions variable. 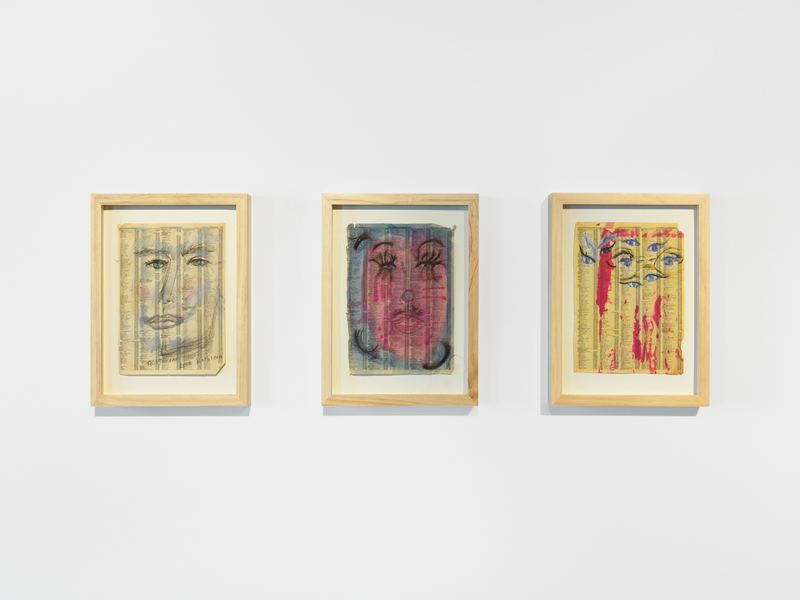 Clockwise: To: Stephen, Love Kathleen, 1991, crayon, pencil on phone book page, 15.25 x 12.25 in., Untitled (girl clown 1), 1991, hair and watercolor, collage, pencil on phone book page, 15.25 x 12.25 in., Untitled (eyes with glasses), 1991, crayon, charcoal, collage, watercolor on phone book page, 15.25 x 12.25 in. 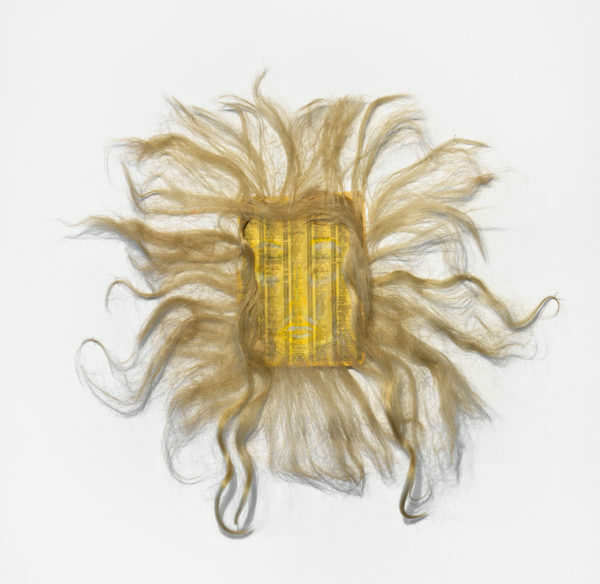 Untitled (blonde spirit), c. 1990s, hair, monofilament. As many queer performers and drag queens began to die from complications related to AIDS their belongings were left unclaimed and began to pile up in the street. White, a witness to these abysmal scenes of theatrics left for trash, had come to know many downtown characters falling victim to the epidemic. 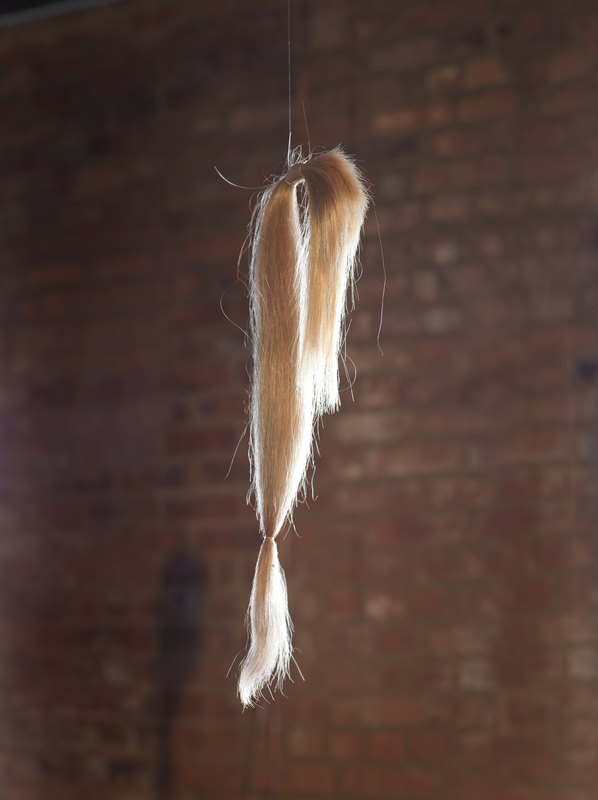 Though primarily a painter, White sought to remember her dying community and began constructing a series of portraits out of human and synthetic hair. The sculptures are exhibited in many ways, arriving in knots, classic curls, very long braids, and anatomical shapes; White’s work often dealt with visceral imagery like the heart-shape that reoccurs throughout her oeuvre. Spirits of Manhattan also features a series of hand altered New York phone book pages from the era crafted into portraits of their own. White received contributions from nightlife legends such as Lady Bunny, Jojo Americo, Billy Erb and David Dalrymple that went straight into the many pieces in the show. 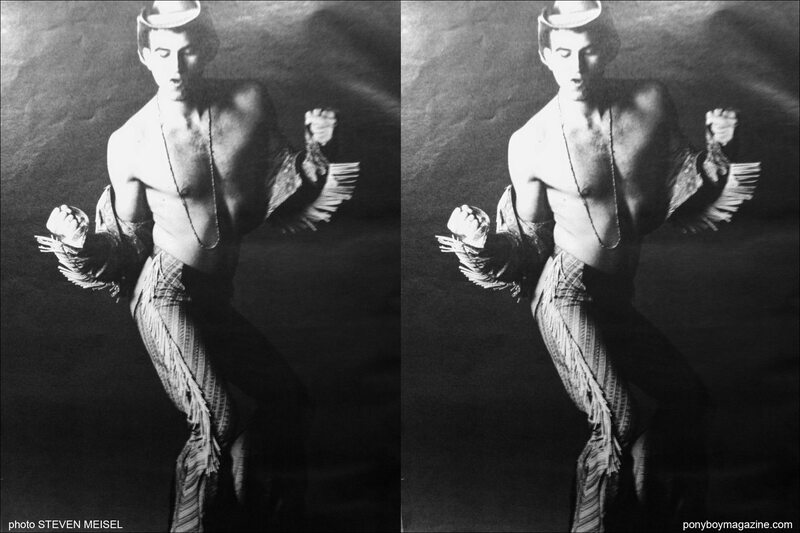 When viewed in it’s entirety, Spirits of Manhattan is an intimate gathering of the myriad personalities that defined a generation of talent lost in the world-wide battle with AIDS. As for the Goldin portraits, some of which are printed here for the very first time, every realm of humanity is touched upon. White is photographed in daylight, at the bar, when she was sad, as she lie in bed, and when she was happy. They are a poignant addition to the already very sweet show downstairs. I was compelled to make many trips up and down the stairs with Everitt Howe. 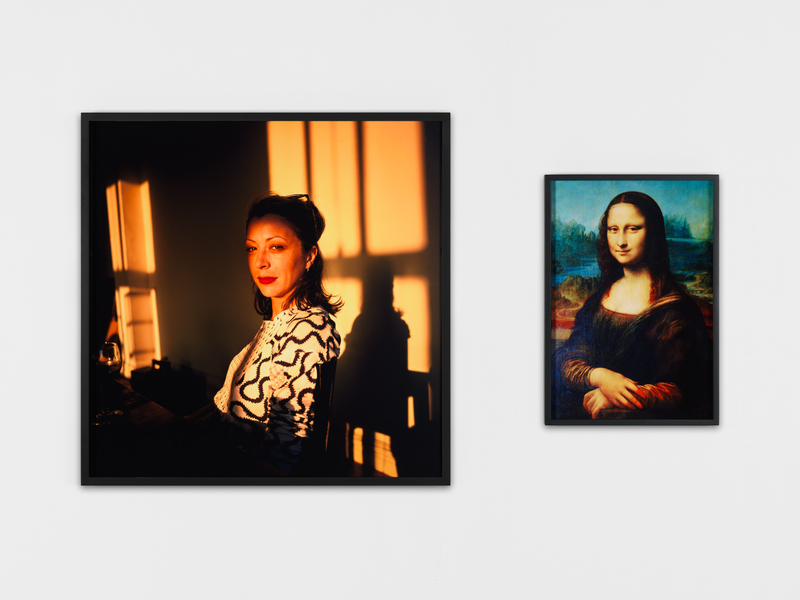 With each viewing, White and Goldin’s work unveiled a richer sense of intimacy between the two and their contemporaries. Their technical skill came through as well. Goldin is a master of natural lighting, and White’s knack for gestural strokes are alive and well in her mixed-media portraits. I trekked to Red Hook, Brooklyn when it was frigid outside, a daunting 18 degree Fahrenheit, but inside I was warmed by White and Goldin’s compassion on full display. A drag queen’s job is the promotion of facade. Befriending the performer behind the face-paint is no easy task, but White’s Spirits of Manhattan uses the incestuous nature of New York nightlife and community to deconstruct these intimidating qualities and aggrandizes her subjects’ joyous individuality. Goldin’s documentary style approach is unprecedented in contemporary photography, and it was marvelous to have been introduced to White through her eyes. Kathleen in her studio, NYC, 1995. Kathleen as Mona Lisa, NYC, 1993. 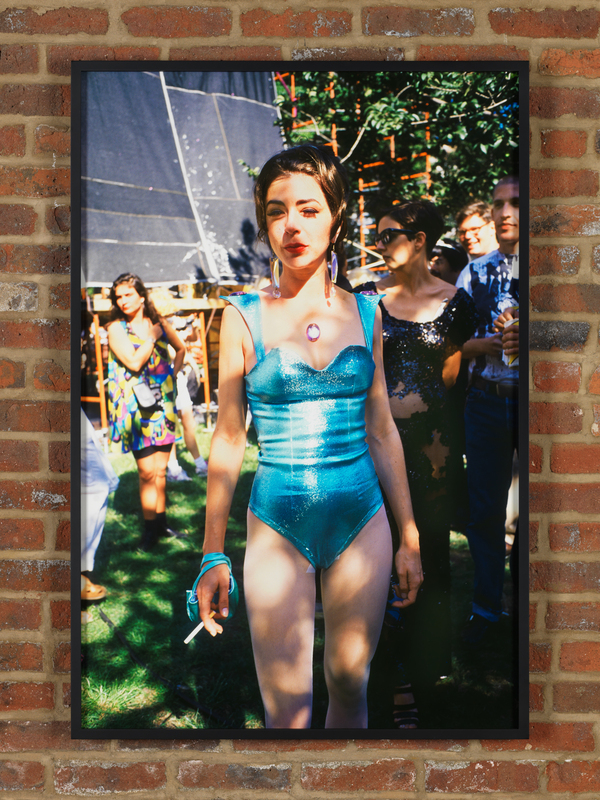 Spirits of Manhattan: Kathleen White and Nan Goldin: Kathleen are on view at Red Hook’s Pioneer Works through February 11th.